Captain America was created by writer, Joe Simon and his partner, an artist by the name of Jack Kirby in 1941. The two concocted the idea of Captain America because they were disgusted with the behavior and actions of Nazi Germany which was one factor that eventually led to the United States' participation in World World II. Therefore, Captain America was created as way to make a political statement. They felt that the war was inevitable. Drawing a character like Captain America may appear to be a hard task considering all of the bulging muscles he has and the skill that it takes to design such a character. However, this article gives step by step instructions on how to draw Captain America. Start by using the drawing method of cartoon sketching using circles. Start drawing the shape of his head by drawing a small circle. Then, sketch in his facial shapes so that you’ll be able to draw in his face proportionally and not crooked. Start drawing out the shapes of his body. I recommend starting with his torso. The torso will look kind of weird, at first, but it should round off to form a set of arms made up of circles that will later become Captain America’s muscular arms and hands. Finally start sketching in his extraordinarily muscular shaped thighs and legs. To finish this, draw in Captain America’s shield by forming a circle. Draw in more detail starting with the face and his head. After sketching in the shape of his head, draw in the details for the mask, eyes, nose, and mouth moving towards sketching the shape of his neck. After doing this, you can start forming his arms and turn them into very cool shape muscular limbs. Once you’ve finished his masculine, strong arms, draw in his fists. After finishing the detailed part of his limbs, start sketching in the formation of his legs. After finishing the details of his muscular legs, draw in the formation of his feet. Draw in the details of Captain America’s outfit. Since you’ve already drawn the circle for his shield, you can now draw in several circular lines within the shield. Draw in his famous star in the middle of his shield and then sketch in his symbol "A" on the middle part of his facial mask. Next, draw his two wings on each side of his fitted helmet and the rest of the details of his boots. Erase the entire sketching residue that resulted from the start of your sketch, so you can have a cool finished look. Do this once you are completely finished and happy with your sketch. 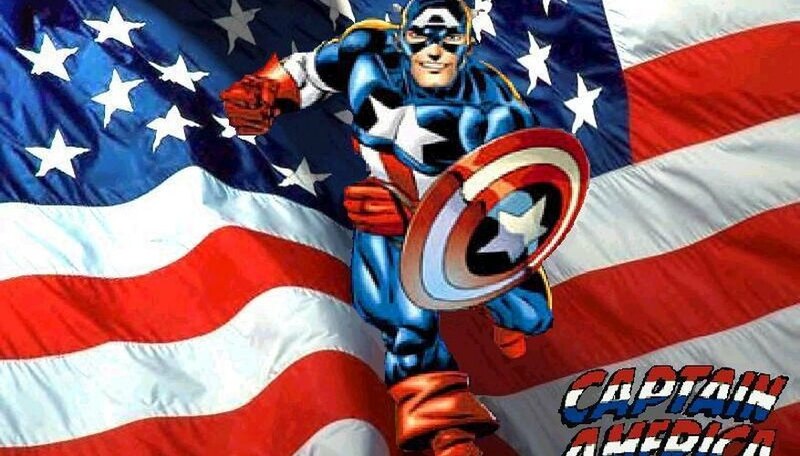 Then finally color in your famous Captain America’s colors; red, white, and blue colors representing the famous American flag.